Second Wind has several ways you can help. On behalf of all those helped by SECOND WIND, we thank you. Thank you so much for your interest in volunteering for the 15th annual Lung Walk to assist Lung Transplant Patients at St. Louis Children’s Hospital and Barnes-Jewish Hospital. The event will be held on October 20, 2018. The event is a One Mile Fun Run. We are eager to have you as a part of this outstanding event. Stay tuned for specific details as the event gets closer. If you’re part of a group, please put your group leader’s name here. Please click on the box below to choose the volunteer roles you would like to do. You can click on multiple roles if you like, but you'll need to reclick in box below to select each extra role. If you are registering as a group, please list the names of Adult (18 years of age and older) Group Members. Please insert commas between names. If you are registering as a group, please list the names of Non-adult (under 18 years of age) Group Members. Please insert commas between names. Volunteers under 18 must be accompanied by an adult. If you are registering as a group, please let us know how many t-shirts you need and in what sizes. Simply write the size on the left, and add the quantity to the right. For extra sizes, please hit the '+' tab at right and add that size and quantity. Our sizes are S, M, L, XL, and XXL. Please let us know if you have any questions or comments. Please include listing any physical limitations or injuries you may have of which we should be aware. 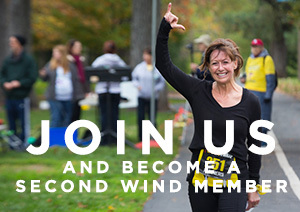 I agree to waive all claims against the Second Wind Lung Transplant Association, Sponsors and/or any personnel and agencies connected with this event for any injury I might suffer from this event. I grant full permission for Second Wind to use photographs of me or my child and quotations from me in legitimate accounts and promotions of this event.